Early results show mp4s in <img> tags display 20x faster and decode 7x faster than the GIF equivalent – in addition to being 1/14th the file size! Background CSS video & Responsive Video can now be a “thing”. Finally cinemagraphs without the downsides of GIFs! Special thanks to: Eric Portis, Jer Noble, Jon Davis, Doron Sherman, and Yoav Weiss. I both love and hate animated GIFs. Safari Tech Preview has changed all of this. Now I love and love animated “GIFs”. The Graphics Interchange Format is not intended as a platform for animation, even though it can be done in a limited way. But they have become an awesome tool for cinemagraphs, memes, and creative expression. All of this awesomeness, however, comes at a cost. Animated GIFs are terrible for web performance. They are HUGE in size, impact cellular data bills, require more CPU and memory, cause repaints, and are battery killers. Typically GIFs are 12x larger files than H.264 videos, and take 2x the energy to load and display in a browser. And we’re spending all of those resources on something that doesn’t even look very good – the GIF 256 color limitation often makes GIF files look terrible (although there are some cool workarounds). My daughter loves them – but she doesn’t understand why her battery is always dead. GIFs have many advantages: they are requested immediately by the browser preloader, they play and loop automatically, and they are silent! Implicitly they are also shorter. Market research has shown that users have higher engagement with, and generally prefer both micro-form video (< 1minute) and cinemagraphs (stills with subtle movement), over longer-form videos and still images. Animated GIFs are great for user experience. Cool! This is going to be awesome on so many fronts – for business, for usability, and particularly for web performance! … but we already have <video> tags? As many have already pointed out, using the <video> tag is much better for performance than using animated GIFs. That’s why in 2014 Twitter famously added animated GIF support by not adding GIF support. Twitter instead transcodes GIFs to MP4s on-the-fly, and delivers them inside <video> tags. Since all browsers now support H.264, this was a very easy transition. As Doug Sillars recently pointed out in a HTTP Archive post, there is huge performance penalty in the visual presentation when using the <video> tag. For example, the hero video at the top of the Velocity conference page is only requested 5 full seconds into the page load. It’s the 27th requested resource and it isn’t even requested until after Start Render, after webfonts are loaded. Worse yet, many browsers assume that <video> tags contain long-form content. Instead of downloading the whole video file at once, which would waste your cell data plan in cases where you do not end up watching the whole video, the browser will first perform a 1-byte request to test if the server supports HTTP Range Requests. Then it will follow with multiple range requests in various chunk sizes to ensure that the video is adequately (but not over-) buffered. The consequence is multiple TCP round trips before the browser can even start to decode the content and significant delays before the user sees anything. On high-latency cellular connections, these round trips can set video loads back by hundreds or thousands of milliseconds. If you use <video> tags to deliver micro-form video, users can’t right-click, click-and-drag, or force touch, and save. And their dancing-cat joy becomes a frustrating UX surprise. Finally, using <video> tags and MP4s instead of <img> tags and GIFs is brings you into the middle of an ongoing cat and mouse game between browsers and unconscionable ad vendors, who abuse the <video autoplay> attribute in order to get the users’ attention. Historically, mobile browsers have ignored the autoplay attribute and/or refused to play videos inline, requiring them to go full screen. 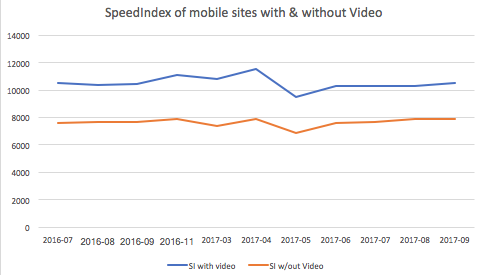 Over the last couple of years, Apple and Google have both relaxed their restrictions on inline, autoplay videos, allowing for Gif-like experiences with the <video> tag. But again, ad networks have abused this, causing further restrictions: if you want to autoplay <video> tags you need to mark the content with muted or remove the audio track all together. … but we already have animated WebP! And animated PNG! The GIF format isn’t the only animation-capable, still-image format. WebP and PNG have animation support, too. But, like GIF, they were not designed for animation and result in much larger files, compared to dedicated video codecs like H.264, H.265, VP9, and AV1. Animated PNG is now widely supported across all browsers, and while it addresses the color pallete limitation of GIF, it is still an inefficient file format for compressing video. Animated WebP is better, but compared to true video formats, it’s still problematic. Aside from not having a formal standard, animated WebP lacks chroma subsampling and wide-gamut support. Further, the ecosystem of support is fragmented. Not even all versions of Android, Chrome, and Opera support animated WebP – even though those browsers advertise support with the Accept: image/webp. You need Chrome 42, Opera 15+ or Android 5+. By enabling true video formats (like MP4) to be included in <img> tags, Safari Technology Preview has fixed these performance and UX problems. Now, our micro-form videos can be small and efficient (like MP4s delivered via the <video> tag) and they can can be easily preloaded, autoplayed, and shared (like our old friend, the GIF). Unfortunately Safari doesn’t play nice with WebPageTest, and creating reliable benchmark tests is complicated. Likewise, Tech Preview’s usage is fairly low, so comparing performance with RUM tools is not yet practical. We can, however, do two things. First, compare raw byte sizes, and second, use the Image.decode() promise to measure the device impact of different resources. First, the byte size savings. To compare this I transcoded the trending top 100 animated Gifs from giphy.com and then converted into vp8/vp9/webp/h264/h265. NB: These results should be taken as directional only! Each codec could be tuned much more as you can see the vp9 fairs worse than the default vp8 outputs. A more comprehensive study should be done that considers SSIM. Yes animated WebP is smaller but any video format is much smaller. This shouldn’t surprise anyone since these modern video codecs are highly optimized for online video streaming. H.265 fairs very well as I expect AV1 will too. The benefits here will not only be faster transit but also substantial $$ savings for end users. Net-Net, using video in <img> tags is going to be much faster on a cellular connection. Next, let’s consider the impact of the decode and display effects on the browsing experience. H.264 (and H.265) has the notable advantage of being hardware decoded instead of using the primare core for decode. How can we measure this? Since browsers haven’t yet implemented the proposed hero image API, we can use Steve Souder’s User Timing and Custom Metric strategy as a good aproximation of when the image starts to display to the user. It doesn’t measure frame rate, but it tells us roughly when the first frame is displayed. Better yet, we can also use the newly adopted Image.decode() event promise to measure decode performance. In the test page below, I inject a unique GIF and MP4 in an <img> tag 100 times and compare the decode and paint performance. The results are quite impressive! Even on my powerful 2017 MacBook Pro, running the test locally, with no network throttling, we can see GIFs taking 20x longer than MP4s to draw the first frame (signaled by the onload event), and 7x longer to decode! Curious? Clone the repo and test for yourself. I will note that adding network conditions on the transit of the GIF v. MP4 will disproportionately skew the test results. Specifically since decode can start happening before the last byte finishes, the delta between transfer, display and decode becomes much smaller. What this really tells us is that just the byte savings alone will improve substantially the user experience. However, factoring out the network as I’ve done on a localhost run, you can see that using video has substantial performance benefits for the energy consumption as well. So now that Safari Technology Preview supports this design pattern, how can you actually take advantage of it, without serving broken images to non-supporting browsers? Good news! It’s relatively easy. Ideally the simplest way is to use the <source type> attribute of the HTML5 <picture> tag. I’d like to say we can stop there. However, there is this nasty WebKit bug in Safari that causes the preloader to download the first <source> regardless of the mimetype declaration. The main DOM loader realizes the error and selects the correct one. However, the damage will be done. The preloader squanders its opportunity to download the image early and on top of that, downloads the wrong version wasting bytes. The good news is that I’ve patched this bug and it should land in Safari TP 45. In short, using the <picture> and <source type> for mime-type selection is not advisable until the next version of Safari reaches the 90%+ of the user base. If you don’t want to change your HTML markup, you can use HTTP to send MP4s to Safari with content negotiation. In order to do so, you must generate multiple copies of your cinemagraphs (just like before) and Varyresponses based on both the Accept and User-Agent headers. Of course, don’t forget the Vary: Accept, User-Agent to tell coffee-shop proxies and your CDN to cache each response differently. In fact, you should probably mark the Cache-Control as private and use TLS to ensure that the less sophisticated ISP Performance-Enhancing-Proxies don’t cache the content. If you can manipulate your HTML, you can adopt the Responsive-Server-Side (RESS) technique. This option moves the browser detection logic into your HTML output. As above, be sure to emit a Vary: User-Agent response to inform your CDN that there are different versions of your HTML to cache. Some CDNs automatically honour the Vary headers while others can support this with a simple update to the CDN configuration. As I’m writing this, Safari will blindly download whatever video you specify in the <img> tag, no matter how long it is. On the one hand, this is expected because it helps improve the performance of the browser. Yet, this can be deadly if you push down a 120-minute video to the user. I’ve tested multiple sizes and all were downloaded as long as the user hung around. So, be courteous to your users. If you want to push longer form video content, use the <video> tag for better performance. Now that we can deliver MP4s via <img> tags, doors are opening to many new use cases. Two that come to mind: responsive video, and background videos. Now that we can put MP4s in srcsets, vary our responses for them using Client Hints and Content-DPR, art direct them with <picture media>, well – think of the possibilities! srcset="cat-160.mp4 160w, cat-320.mp4 320w, cat-640.mp4 640w, cat-1280.mp4 1280w"
Video in CSS background-image: url(.mp4) works, too! By enabling video content in <img> tags, Safari Technology Preview is paving the way for awesome Gif-like experiences, without the terrible performance and quality costs associated with GIF files. This functionality will be fantastic for users, developers, designers, and the web. Besides the enormous performance wins that this change enables, it opens up many new use cases that media and ecommerce businesses have been yearning to implement for years. Here’s hoping the other browsers will soon follow. Google? Microsoft? Mozilla? Samsung? Your move! Colin Bendell is a performance and ideas junkie. He is co-author of O'Reilly's High Performance Images and part of the CTO Office at Cloudinary.